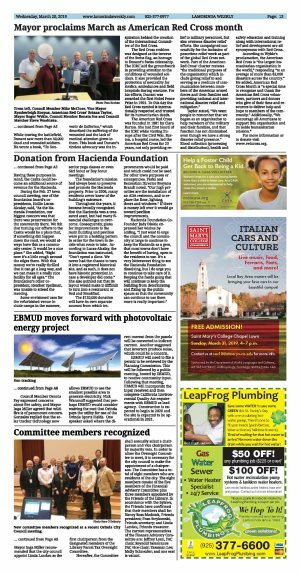 The Orinda City Council included on its March 5 agenda a measure to recognize newly appointed city commissioners and committee members. The following individuals were recognized: Robert Hubner, Planning Commission; Peter Hasselman, Historic Landmarks Committee; Travis Blaschek-Miller, Traffic Safety Advisory Committee; Stuart House, Traffic Safety Advisory Committee; Chris Decareau, Ciizens' Infrastructure Oversight Commission; Jerry Condon, Citizens' Infrastructure Oversight Commission; Suzanne Huhn, Finance Advisory Committee and Shelley Hubner, Art in Public Places Committee. Last month, at the suggestion of Mayor Inga Miller, the city appointed council members Amy Worth and Nick Kosla to serve on a school/city committee to meet with the Orinda Union School District trustees once or twice a year to discuss issues of mutual interest. Currently Council Member Nick Kosla serves as the liaison to OUSD. The new committee sprang from talks between city staff and OUSD Superintendent Carolyn Seaton. The committee will be composed of two members of the Orinda City Council and two OUSD trustees. The Orinda city manager, the OUSD superintendent, and other staff members, as appropriate, will attend these meetings. The OUSD members of the committee will be President Hillary Weiner and trustee Jason Kaune. 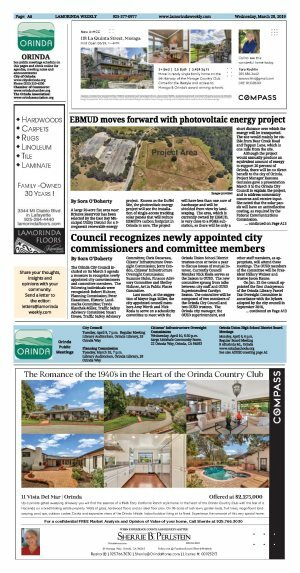 On Jan. 22 the council appointed the first chairperson of the Orinda Library Parcel Tax Oversight Committee in accordance with the bylaws adopted by the city council in September 2018, Mayor Inga Miller recommended that the city council appoint Linda Landau as the first chairperson from the designated members of the Library Parcel Tax Oversight Committee. Hereafter, the Committee shall annually select a chairperson and vice chairperson by majority vote. In order to allow the Oversight Committee to meet, it is necessary for the city council to make the appointment of a chairperson. The Committee has a total of eight members who are residents of the city. 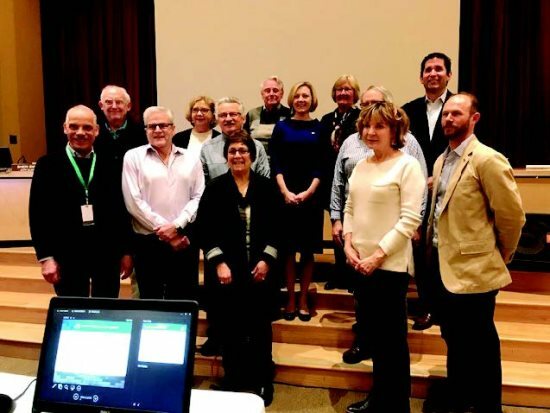 The eight members consist of the five members of the Financial Advisory Committee plus three members appointed by the Friends of the Library. In accordance with the bylaws, the Friends have confirmed that their members shall be: Nancy Ross-Madnick, Friends president; Fran Strykowski, Friends secretary; and Linda Landau, Friends treasurer. The current representatives of the Finance Advisory Committee are: Jeffrey Lyon, FAC chair; Reynold Samoranos FAC vice-chair; Yasaman Lee; Molly Schneider; and one seat is vacant.